← Win Tickets To See Problem & IAMSU “Million Dollar Tour” in Los Angeles! The 32-year-old star sported a garish floral gown over her blossoming baby bump, which she bizarrely teamed with matching gloves and heels on the New York red carpet. The reality show star wasn’t exactly shy about flashing the flash as she joined boyfriend Kanye West for one of fashion’s biggest events. The dress was rather bizarrely teamed with strappy sandals which gave the ensemble an overly matched look. Meanwhile, Kanye West also wore Givenchy, but looked much more classy in a simple black suit and white shirt. The couple are expecting their first baby this summer. It was revealed the star decided at the last minute to wear the garish creation, according to Life & Style. She had the Givenchy severely altered at the last minute on orders of her new stylist, a fashion insider told the magazine. She’s gained a lot of weight in her arms and her stylist has told her she should not show them off, they added. So her dress now has sleeves when it was sleeveless before. 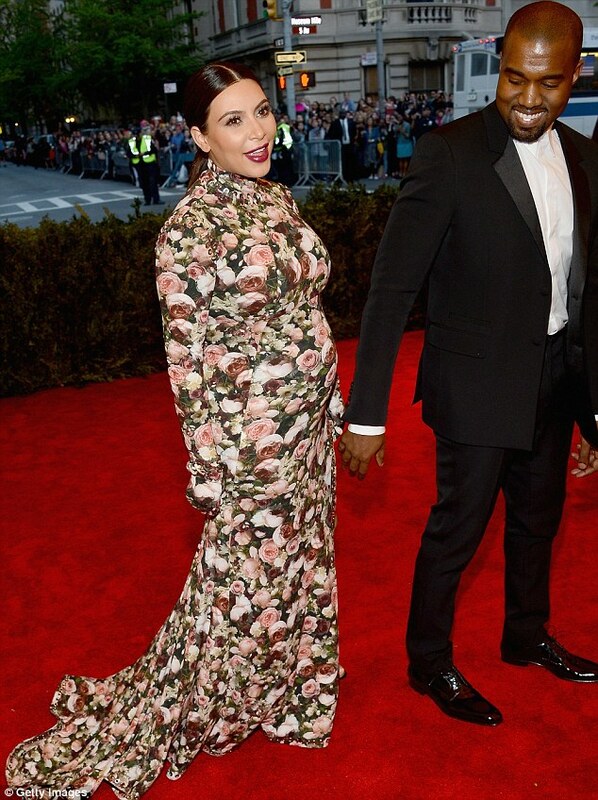 The source claims that Kanye was unimpressed that Kim decided to mess with the dress. Kanye is annoyed, as the dress is by his best friend Riccardo Tisci at Givenchy, and he feels embarrassed that Kim is messing with a beautiful piece of art,the source said. Apparently, Kim was having a ‘hard time’ trying to fit into her original choice of dress before opting for the Givenchy gown.It had to be modified five times for her growing frame, a friend of Kim’s told the magazine last week. 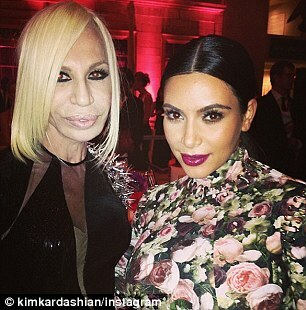 Meanwhile, the star posted photographs of herself posing with designers Donatella Versace and Valentino at the event. It is not known whether Kim’s rather outlandish choice was approved by Vogue magazine editor Anna Wintour who is reported to have hosted both Kim and Kanye at her New York home last night. Kim and Kanye were photographed going into Wintour’s home on Sunday for an intimate dinner. The annual gala highlights the Metropolitan Museum of Art’s spring exhibition: PUNK: Chaos to Couture in New York. The event attracted a slew of stars including Sarah Jessica Parker, Katy Perry, Beyoncé and Anne Hathaway. 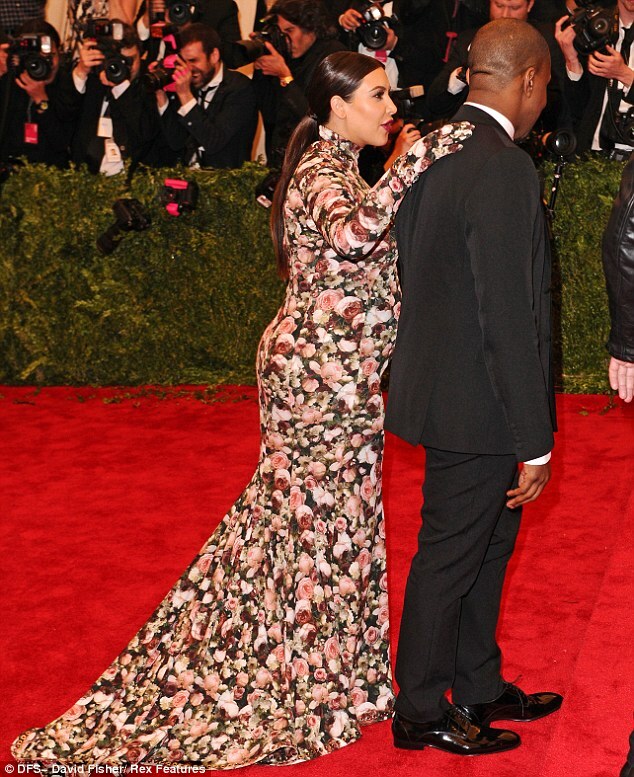 This entry was posted in Gossip and tagged Dress, Flowers, Kanye West, Kim Kardashian. Bookmark the permalink.